Following independence from France, President Habib Bourguiba launched a series of reforms aimed at modernizing the Tunisian state. He created a modern educational system and Tunisia’s Personal Status Code, legislation that required relative equality between men and women. To bring Tunisia closer to the Western world, Bourguiba tried to undo everything that he associated with religious conservatism. Alhough he restored Tunisia’s al-Zaytouna Mosque, he dismantled other Islamic institutions and, advocating a modern interpretation of Islam, even encouraged Tunisians to break with the tradition of fasting, a shock to many observant Muslims. The goal of those rebelling against the French during the protectorate was generally to create a more open and democratic Tunisia, but many would soon be disappointed with Bourguiba’s government as it became increasingly authoritarian and exclusive, promoting the interests of the Tunisian secular elite while largely disregarding the needs of the general population. This culminated in 1974, when the Tunisian National Assembly changed the Constitution to allow Bourguiba to become President for life. The President also failed to reform the government to prevent a general economic crisis. Economic hardship and political repression resulted in the late 1970s in student and labour unrests, led by the Tunisian General Labour Union (Union Générale Tunisienne du Travail, UGTT), the government’s most powerful opposition. In 1978, a strike turned violent when Bourguiba cracked down on demonstrators, resulting in the deaths of at least 30 protesters and the arrest of 200 trade-union militants, including senior officials such as UGTT’s Secretary General Habib Achour. A few years later, economic hardship once again brought Tunisians onto the street. For several days in 1984, Tunisians protested, forcing the government to reverse its doubling of bread prices. On taking power, Tunisia’s next President, Ben Ali, promised to open up the country, politically and economically, and to pave the way to democracy. 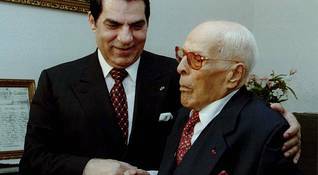 At the beginning of his rule, Ben Ali did, in fact, ease laws restricting the press and released many political prisoners who had been imprisoned under the former regime. Many political parties were legalized, and Tunisia’s Islamists, now under the banner of Ennahda (Renaissance), were allowed to participate in the 1989 elections, as independents. But when election results showed the extent of the Islamists’ power, Ben Ali falsified the results, claiming to have gained 99 percent of the vote. At the same time, the emergence of violent factions within the Islamist movement served as a pretext for launching a nationwide crackdown on Tunisia’s religious conservatives. While only a minority of Islamists advocated violence to topple the regime, Ben Ali and his secular regime soon denounced the entire Islamist movement as ‘terrorists’. 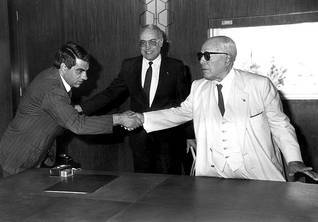 But knowing well that he could not afford to alienate Tunisia’s population at large – many citizens were practicing Muslims, unlike the mostly Westernized elite – President Ben Ali introduced religious policy into his government programme. For example, he founded the Zine al-Abidine Ben Ali mosque in Carthage, a rich suburb of Tunis, and created the Ministry of Religious Affairs. He stressed his own personal religiosity by announcing in public that Ramadan should be observed and by launching a propaganda campaign showing him on pilgrimage to Mecca, thereby trying to distinguish himself from Bourguiba’s secular establishment.